Some of you may watch a show called the Amazing Race. For those that don't watch it, I'm pretty sure most of you are aware of the premise of it. The show revolves around teams who race around the world completing tasks and experiencing the world in a way never thought possible. Well, I'd be lying if I said that is what I competed in a week ago, however, a foreigner operated magazine in Seoul did their best to create an amazing race style event in Seoul. The race consisted of 35 teams scrambling around Seoul for twelve hours (There were 16 stops). It was an epic marathon of sweat, eating, getting lost, and experiencing more in one day than I have ever done in Seoul. The events included some relatively easy tasks such as finding an establishment, or beer tasting. There were also some creative tasks such as writing our names in Korean, getting kids to guess English words, making and selling Kimbap (Korean version of a California roll), and trying to catch water balloons blindfolded. However, for my team, the most terrifying and horrid tasks were the eating tasks. They weren't bad because everything we had to eat was something I had eaten before. They were horrible because nobody else on my team could eat them, meaning I had to ingest all of them. The first eating challenge was not difficult at all. I think they may have run out of the original item, or the fish they chose did not ferment at all. Either way it was simple, but chewy. The last challenge however was where the race separated the strong from the weak. Enter canned silkworm larva. Now, for anyone who has ever been to Korea, they know about this stuff and tend to avoid it like the plague. Put it this way, most Koreans don't really like this stuff. 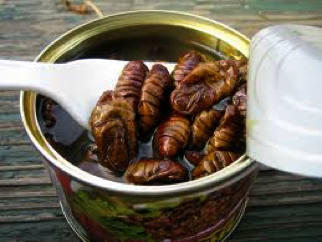 In essence, Beondegi (bone day gi) is boiled silkworm larva. However as unappetizing as that sounds, the stuff smells and tastes like three week old gym socks. And this is the fresh stuff that is made in the markets and stuff. The canned version of it, like the canned version of pretty much anything is nastier. When I realized that I was going to have to eat an entire can of Beondegi I immediately began to fear for my team. This was the one thing in Korea that I was afraid of having to eat. I have had them a few times before and they're not good. The biggest problem is that when you bite into them they tend to explode and squirt foul tasting liquid. One at a time they are manageable and do not cause much of a gag reflex. However, when you have a mouth full of them and they all explode at the same time, you can't help but gag. Luckily one of my team mates had a bottle of vitamin water. The taste was so bad that I was having to put ten to twenty of them in my mouth, fill it with vitamin water, and then chew and swallow. Afterwards I had to drink again to help keep them down. There was actually a few times I almost threw up while eating. Not fun. Needless to say though, my ability to power through something this nasty was a major reason for our success. I wish I could say that we won the race and our team was showered with adulation and honor, however, we came in 16th of 35. This is not as bad as you'd think. When we hit our first pit stop we were 11th. However, at the next pit stop, due to some unfortunate directions and getting lost we were 32nd. In 6 stops we managed to pick up 16 spots. I'll count that as a win any day of the week. We emerged from the day, worn out, exhausted, and happy. It was a great day, and while the result may not have been great, I would do it again if it ever presented itself. I had a great team. My team was Gisela, Malani, and Hana. We all did our parts and supported each other when we needed it. I'd do it with them again, however, I might choose to make them eat the silkworm larva next time.